The Fundy Geological Museum is the centre for field research related to the Triassic and Jurassic fossil sites located in Nova Scotia’s Bay of Fundy region. The Jurassic sandstone cliffs of the Parrsboro shore represent a time of great global change. Fault lines that cut through these rocks and dinosaur bones represent massive earthquakes that broke apart the supercontinent Pangea 200 million years ago. The rupture caused the geological structure of the Bay of Fundy. A large and ancient rift basin that was shifting and sinking for 40 million years, these rocks preserve a rich fossil record from the dawn of the dinosaurs. The power of the world’s highest tides of the Bay of Fundy causes the sandstone cliffs to erode very quickly. The rapid erosion exposes new fossil specimens every year and makes this one of the richest sites in North America for new fossil discoveries. In 2016 the Museum staff and volunteers are examining new fossils eroding from the research site at Wasson Bluff. A sandstone layer that contains scattered bones of small lizards and dinosaurs is of interest for potential to provide additional evidence of early dinosaur evolution. The Museum staff are examining the site to document the types of animals represented by the 200 million year old bones and teeth found at the site. From June 24 to 28, Museum staff and volunteers will be examining the sandstone layer exposed from the erosion that occurred last winter. The field work begins with documenting the small bones exposed on the surface of the layers. Take time to visit Parrsboro and explore an ancient landscape. The eDinos.ca website was developed to provide a dialogue and updates about ongoing research projects related to the Mesozoic vertebrate paleontology in the Bay of Fundy. The Facebook page has a growing audience – and provides an excellent way to share photos and videos related to ongoing field work or research projects. Posts like this on the website are also meant to help organize and structure research projects, to allow public engagement with ongoing natural history sciences. The 2013 expedition at Wasson Bluff occurred from August 9-18th, with a crew of 4-6 people working along the beautiful shores of the Bay of Fundy. Several new dis-articulated bones were discovered during this year’s field work. There was a vertebra, digit from the pes (back foot), a small rib and a large portion of what may be a skull/jaw element. Several specimens will be picked up from the Fundy Geological Museum and examined briefly in Halifax (Dalhousie University and Nova Scotia Museum). A manuscript is nearly complete, describing a new occurrence in the McCoy Brook Formation for a mammal-like reptile Family (Tritylodontidae). The paper will be shared with co-authors and then submitted for publication (target of Jan 2014). Photogrammetry 3D digital models will be developed from the data collected during the recent dig. A new pilot project to create 3D digital photograms of previously collected blocks of articulated dinosaurs material is being planned. The 3D digital projects will also be completed by January 2014. Two honours students from Dalhousie Earth Science will be completing research projects based on the Wasson Bluff locality. On Saturday I will be returning to Wasson Bluff to meet with Dr. Martin Gibling and Colin Price to examine the ‘fish bed’ section examined last year. Paleontology seems unique among the sciences for the large amount of time and effort that volunteers contribute to the research activity and field discoveries. As the 2013 Bay of Fundy Dinosaur Dig has finished, it is striking how much time and energy people contributed to the field work. Thank you to all those in the field crew, who now know the effort involve in climbing a 70 degree slope at the end of a hot and physically exhausting day. Mary Leaman, a geologist with Shell Canada (Calgary), traveled across the country to volunteer several days of her vacation to work at the dig site. This was a return trip for Mary, as she first volunteered on a similar dig nearly ten years ago while still a teenager. Gordon and Marliegh Leaman also spent many hours digging and sweeping; a unique family vacation indeed. Mary and Gordon Leaman digging out the dinosaur site; hard and hot work. Vicki Daley, Brian Matthews and Kimble Scull also contributed several days of back-breaking and hot work, shoveling, sweeping, jack hammering, as well as hours in sprawled on the ground while carefully exposing 200 million year old bones from the damp sandstone. The energy and enthusiasm of everyone working together was obvious every day, and good friendships have developed. Leigh van Drecht and Vicki Daley expose dinosaur bones at the research site. Although not volunteers, the enthusiasm and dedication of Kathy Ogden and Leigh van Drecht was essential to the success of the 2013 dig. Kathy, Registrar of the Nova Scotia Museum, contributed previous expertise in dinosaur preparation and field work at the site. As a student Leigh was a first timer at the dinosaur dig but contributed excellent sedimentology expertise and field skills. The effort Kathy and Leigh devoted to the team set a positive tone that benefited everyone. Kimble Scull, Kathy Ogden, Leigh van Drecht and Brian Matthews work at the dinosaur site. Keenan Richard dropped by twice to lend a hand, and he discovered the first exposure of what appears to be an articulated dinosaur digit (toe). Bob Grantham, Dr. Grant Wache, and Dr. John Calder all visited the site – and shared expertise and insight. Dr. Martin Gibling visited twice and was quick to pick up the shovel when required, but also offered additional direction to the sedimentology studies at the site. Dr. John Calder at Wasson Bluff, with Kennan Richard and TJ Fedak. Thank you to all of you who contributed so much to this year’s field work; your generosity and passion are greatly appreciated. 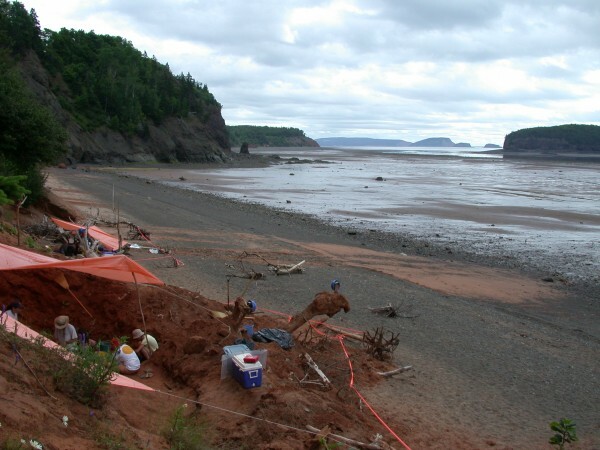 The success of the 2013 Bay of Fundy Dinosaur Dig would not have been possible without you.